In keeping with Shabbat’s requirement not to use electricity, R&E did not tape this segment on the Sabbath. RABBI NISSAN ANTINE (Senior Rabbi, Beth Sholom Congregation in Potomac, Maryland): In the Torah God creates Shabbat. God even has to create the concept of rest. God creates the world in six days, creates the trees, the plants, the animals, even humankind. And then afterward it says that God rested on the seventh day and sanctified it. Shabbat was a commandment given to Adam and Eve, which is prior to the Jewish people. We didn’t even exist as a people yet. God gave the Shabbat to humanity. SARAH ANTINE: Once we light the candles, I often will think of something that I’m grateful for. RABBI ANTINE: Some of the big things we are not allowed to do on Shabbat is write; any kind of writing would be prohibited. All of our cooking and food preparation has to be finished on Friday afternoon before sundown. SARAH ANTINE: We don’t look at our cellphones, we don’t write emails, we don’t drive in the car to run an errand. My kids don’t even ask for television or computer games or anything like that. We love to sing “Shalom Aleichem” because it’s a beautiful melody, and it means that we are inviting the angels into our house, blessing them, and sending them on their way. RABBI ANTINE: I love blessing my children. My wife and I bless our children every single Friday night, and it really teaches me what it means to be a father, and I think it’s the ritual of the blessing that creates that sacred moment. In society, oftentimes we measure our success by the things we have built, and the lesson of Shabbat teaches us when you stop building it’s about those more interior kinds of things, things about working on your soul, working on your friendships, your relationships. Those are really the important things in life. Those are the things we are going to be remembered by. SARAH ANTINE: One of the rituals that we do on Shabbat that has a lot of meaning for me spiritually, it’s called netilat yadayim, which is the ceremonially washing of the hands—the idea of lifting up our hands to do God’s work, or spiritual work, rather than our hands doing mundane things. RABBI ANTINE: You have the same eating of bread, if you will, on a Thursday, also happens on Shabbat. But when you do the special prayers around it, you’re sanctifying it, and now it’s a vehicle or a tool to appreciate what God has given us. There is something about the eternal that, over the day of Shabbat, that we can connect with, we can become part of, and we take that and that informs our next week. The idea of taking 24 hours off from the constant need to create, to build, to do more, and just to be able to reflect—this is a universal gift for everyone to be able to take advantage of. Every week, from sundown Friday to sundown Saturday, Jews around the world celebrate Shabbat, the Sabbath. A day of prayer, rest, and reflection, Shabbat provides the spiritual renewal, some say, needed for the rest of the week. 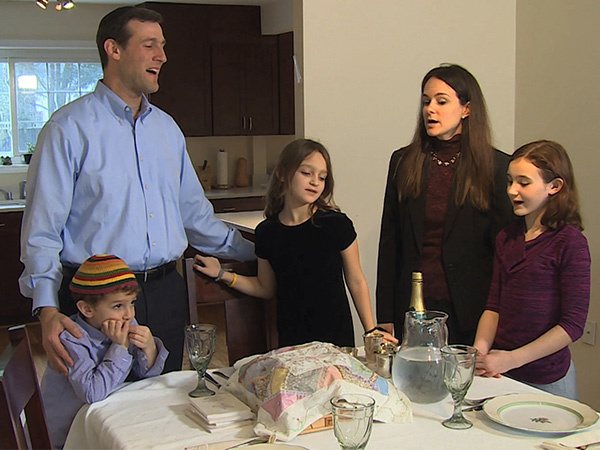 We spoke with Rabbi Nissan Antine and his wife, Sarah, of Beth Sholom Congregation in Potomac, Maryland about the meaning and practice of Shabbat.